At the Southernmost tip of New Jersey - and almost as far South as Washington, DC - the combined port of Cape May/Wildwood is the largest in New Jersey and one of the largest on the East Coast. The center of fish processing and freezing in New Jersey, Cape May/Wildwood is the home port to some of the largest vessels fishing on the Atlantic coast and has led the way in developing new fisheries and new domestic and international markets for New Jersey seafood. Major Cape May fisheries focus on squid, mackerel, fluke, sea bass, porgies, lobsters and menhaden. In addition to these, Wildwood boats aare also in the surf clam/ocean quohog fisheries. Like many Jersey Shore communities, much of Cape May's and Wildwood's economies are dependent on seasonal tourism - which is dependent both on the weather and the overall state of the economy. 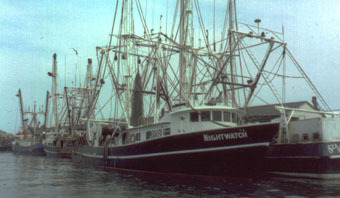 The year-round character of commercial fishing is a major factor in keepnig these communities going in the off-season.